Potatoes are vegetables => both chips and crisps both count. 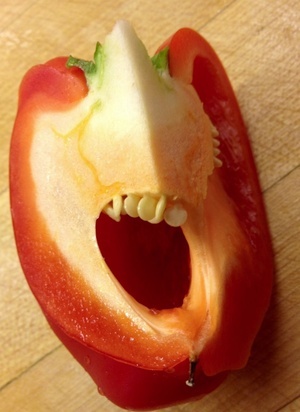 The Irish eat too many imported vegetables. Organic farmers have shown that production of many interesting varieties of vegetables is possible in our climate. Irish farming needs to diversify. BUT WHAT ABOUT THE SPUDS?! Millie:- FRENCH FRIED SPUDS can make you spud-shaped, an distinct impediment when dancing ceili or fox trot.The Chinese shred spuds and quickly stir fry in a delicious sauce. Now that’s the way to cultivate a dancing figure. And if you aspire to the breeding abilities of a rabbit, try lots of salad (with reduced mayonnaise) including young dandelion leaves. How did you know my secret ambition to become a bunny? Why are the UK stats “unreliable”? I presume it is because there were not enough people surveyed. This will be a combination of the survey data collected at national level. Not all countries collect data on exactly the same things or from equivalent sample sizes. They voted in favour of the five a day, but are having great difficulty in implementing it. Looks like something from The Onion. “Ate vegetables at least once a day” – once a day? Who are the 16% who don’t hit that mark and what are they living off? I can see not getting your 5 a day, I rarely hit that, but not even one a day?! Are they just living off meat sandwiches? And do they all have scurvy and rickets? Probably haven’t had a normal bowel movement in DECADES. This baby can hold up to fifty pounds of impacted semi-digested meat product before emergency surgery. I vegetate for a while every day – does that count? I am an expert on vegetating and I say yes. yes it does. I don’t find it surprising that 84% of people in Ireland eat vegetables every day, no. 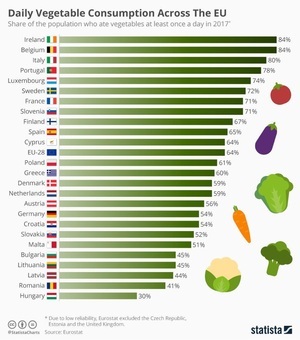 only 30% eat veg, no wonder theyre always hungary! Surely “Daily Vegetable Special Communications Unit Consumption”. Other than Tayto, deeply suspicious.